I was planning our dinners, and it occurred to me that I hadn’t made fettuccine alfredo in quite some time. I bought the alfredo sauce, but rather than buying fettuccine, which we were out of, I used penne pasta. I sometimes get tired of the long pastas: fettuccine, angel hair, spaghetti. They tend to be a lot of work at the table when you need to either wrap them around your fork or cut them with the fork. 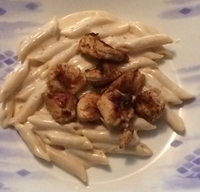 Using the penne made the meal nice and easy to eat and we got the full flavor of the alfredo sauce. For the protein I cooked pieces of chicken seasoned with Cajun spice. It all worked out very well.